Maddy Denner, right, will be reunited with twin Elena, left, at Notre Dame for the spring semester in January. Note: This report was updated 9/19 at 8:50 pm. Maddy Denner, a two-time CIF-State champion for 1600 meters and the MileSplitCA Girls Track Athlete of the Year for 2018, has been accepted for enrollment in the spring semester at Notre Dame, and will join twin sister Elena in South Bend beginning with the spring semester in January. Denner, who had signed with Michigan but never attended classes this fall, confirmed the news in an interview Tuesday night. "I decided to attend Notre Dame next spring, and I'm staying home until then," Maddy Denner wrote as part of an email and text interview on Tuesday. "Nothing against Michigan at all, I just decided I wanted to be with Elena." Maddy, 18, said she made the decision to not attend Michigan on Aug. 2 but said she had been considering making a change since "towards the end of track and all of summer. But I didn't speak up until August 2," Maddy wrote. "Elena and I talked about it but we didn't think anything could be done. "I guess I should say I didn't have the courage to actually do anything because it is a hard process. But when it really came down to it, I wanted to be at ND with Elena and I was willing to take the necessary steps." Maddy wrote that she received her release from Michigan within two days of requesting it and then she "called (Notre Dame distance) coach (Matt) Sparks, sent in my transcripts, and applied to ND." On Tuesday, Maddy Denner said she received confirmation that she would be accepted at Notre Dame for enrollment for the spring semester, beginning the third week of January. "I was already pretty sure I was getting in because of what Coach Sparks has been telling me but I'm relieved that it's official," Maddy said. "It was really hard to let go of Michigan, as the team and Coach (Mike) McGuire were so kind. But Elena and I grew the closest we have ever been over the past few months and I don't want to miss out on this chapter of my life without her by my side." Speaking by phone on Wednesday, Maddy said of Notre Dame: "I'm really excited to join the team and be part of such a great school -- both a great team, great academics and great culture. I also want to say thinks to everyone who supported me and helped me get through this hard process." Maddy said she and Elena took their only two recruiting visits to Michigan and Notre Dame and that Elena chose Notre Dame first. Maddy then decided on Michigan last September, roughly six weeks after their 17th birthday. "I made the decision so early, and so did Elena," Maddy said. "I think I didn't really think about how going separately from Elena and my parents and moving so far away would really be like until when it came time for it, and I really didn't feel good about it anymore." "I just felt like Elena and me really belonged together." Maddy said the bonding between the sisters increased as during the track season and at the State finals, where the duo put on an epic performance. After the meet, the sisters talked about their bond and how difficult it would be to not be in the same uniform after that night. In previous interviews with the twins, their bond was obvious. At the end of the State track championships in June, following the awards ceremony and interviews, the two were spotted warming down, running very slow laps on the Buchanan High track, alone on the track, but together. 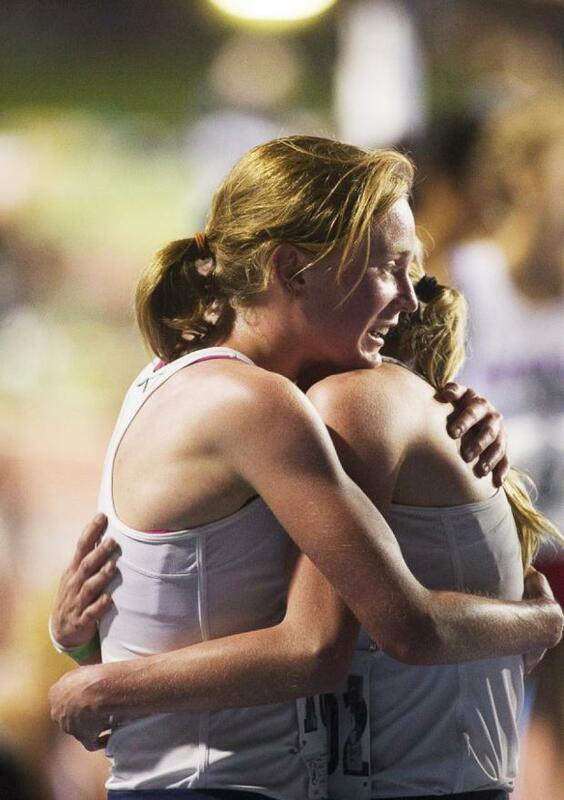 At the State track final, Maddy cranked up the volume with about 600 meters to go, as is her custom, and crossed in a 4:42.77 PR to beat Davis Senior's Olivia O'Keeffe for the second year in a row. Elena was fourth in 4:45.49. Later in the 3200, it was Elena who took her time in the pack, moving up slowly before hitting another gear late and running away with the victory in 10:10:32. Maddy was second -- exhausted but inspired by her sister's performance, she said later -- in 10:11.56, again crossing just ahead of O'Keeffe (now at Washington). 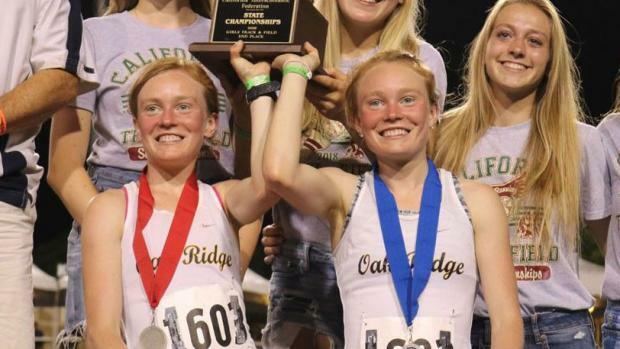 In a conversation Wednesday, Maddy spoke about the impact the State meet had on the sisters' relationship. "That was our big game-changer," she said. "I remember that night at the hotel together. Our legs were burning and it was 2 am by the time we got back (after post-meet celebration at the Cheesecake Factory). But we were wide awake. It was such a big night and we couldn't sleep. We woke up super early the next day. We honestly couldn't sleep because we couldn't stop talking to each other. Those pictures of us really sum up how we both feel about that night." "Being on that team with her was pretty amazing," Maddy said. Two weeks later, Maddy Denner ran her 3200 PR of 10:08.01 to set a meet record at the venerable Mt. SAC Relays, held at El Camino College, running away from a hobbled Claudia Lane in a nonetheless stunningly dominant victory. It could be considered a modicum of revenge for Denner, who placed second to Lane in the State 3200 final in 2017. Maddy, who ran 4:44.89 to beat O'Keeffe for the State 1600 title in 2017, went faster 4:44.01 at the Sac-Joaquin Section Masters Meet in May, but on that day it was O'Keeffe for the win in 4:42.71. Elena punctuated the epic race finishing third in 4:45.15. O'Keeffe's time would hold up as the fastest 1,600 run in the U.S. in 2018, with Maddy's time at State at No. 2 and Elena's time at SJS Masters No. 8. 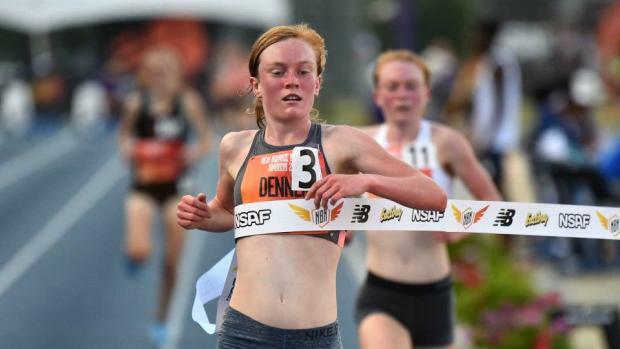 Maddy closed out her high school career with a performance at New Balance Nationals Outdoor that personifies her talent, drive and perseverance. 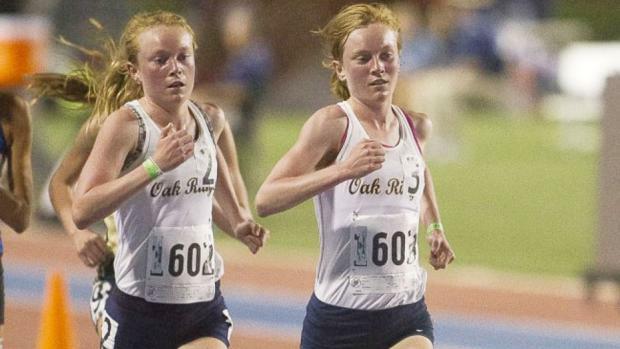 With 600 to go in the invitational 2-mile race, she was spiked along the bottom of her leg around her ankle, a cut that would require 12 stitches. Running through the injury, Denner kicked home to win in 10:04.53. The girl who inadvertently spiked Maddy was Olivia Theis, who would have been her teammate at Michigan. "I don't think it affected my finish but could have possibly affected my time a little since I had to swerve," Denner wrote in an email response to questions a few days after that race. "I'm not sure how Olivia Theis would have finished but if she was ready to run under 10 and finished strong, I think it would've helped me run faster too. I've never been spiked so badly (that) I needed help before." Denner's winning time from NBNO ranked U.S. No. 6, CA No. 9 all-time, and No. 30 on the all-time U.S. list. It converts to 10:01.02 for 3200 meters, which ranked U.S. No. 3 for 2018. The addition of Maddy Denner and Theis was enough for FloTrack to rank Michigan as the best in the nation among distance recruiting classes coming into the fall. That ranking also listed Notre Dame third. As of the Sept. 11 USTFCCA national women's cross country rankings for Division I colleges, Michigan ranked 12th and Notre Dame ranked 23rd. While home in El Dorado Hills, Maddy has been nursing a slight injury but said she expects to be ready for the indoor season at Notre Dame, where she expects to join Elena running the 3K and 5K, and outdoors where the duo are expected to compete in the 5K and 10K. She said she has been keeping busy helping out with her middle school cross country team at Rolling Hills MS (she said the coach there, Mrs. Pickett, "was the one who really got me into running" (in 7th grade), and working a few days a week at Mathnasium. Math? Yes, Maddy said she, like Elena, will study applied mathematics and computational statistics. "I just really like it," Maddy said. "I can get really lost in it. I've always wanted to major in math."